Modern weddings might often look like complete departures from weddings of the past, however, many brides choose to inject tradition into their big day. Bouquet tosses that predict the next marriage, arranging your something old and something new, and avoiding your groom until you walk down the aisle are some of the most time-honored traditions that have been etched into many couple’s wedding plans for decades. Many brides just know from the moment they get engaged these rituals will play a role in their event and many don’t give it a second thought. 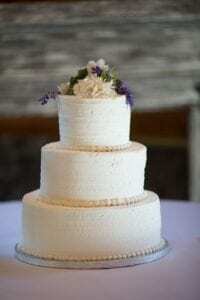 For example, saving the top tier of your wedding cake is something many brides just do. But have you ever asked why? Today we will talk about this great tradition, why we do it, and share tips to make sure you to can have your cake and eat it too! The tradition of saving the top tier dates back to the early 19th century. Tiered cakes made their debut during this time and each tier served a very important purpose. The bottom would be cut and served at the wedding, the middle would be packed up and sent off with departing guests, and the top would be saved for a very special future occasion for bride and groom. The occasion? Back then it was the christening of the couple’s first child, that’s right, babies! Since most women would celebrate the birth of their first child within the first year of marriage, couples would save the small top tier to celebrate, instead of buying another expensive cake. Today many couples wait to have children until later in marriage, leading to the celebration of the first year of marriage instead. Now let’s talk about the steps you need to take if you want to save the top tier of your wedding cake. Talk to your cake designer. Let them know your plan and make sure they provide a small box upon delivery to ensure that your top tier actually has a place to go. Designate someone to be responsible for it. If your leaving straight on your honeymoon make sure one of your bridesmaids or even your parents know they are tasked with taking the top tier home and putting it in the freezer. Protect it. After you return from your honeymoon take the cake out of the box, wrap it in saran wrap and then place it in a large Ziploc bag. This will keep the cake from getting dreaded freezer burn. If all this sounds like to much work, ask your cake designer if they provided anniversary cakes! (many modern bakeries now offer this option). For an additional fee, the bakery can provide you with a brand new top tier of your original wedding cake to be redeemed on your one year anniversary. So whether you’re celebrating one year of marriage, the birth of your first child, or simply whatever you want to, you can relive the magic of your wedding by sharing a sweet treat together! Want more tips on all things weddings? Contact Magnificent Moments Weddings, we would love to help you plan your big day!